“Okay… here’s my price.” He wrote a figure down on a scrap of paper with a pencil stub. What do you do when a familiar dies? Up until now, your only option was to get a bag and a shovel, then gather reagents for an expensive “replacement ritual.” Is this any solution when you’ve lost a dear friend? There is another option. As raise dead except you restore to life an animal, animal companion, or familiar. Another interesting option is to create a homunculus instead of or in addition to your animal familiar. The telepathic link alone is almost worth the price! They are able to count coins, hold light sources, and fetch tiny objects like wands and potions (making drawing them a free action for the owner). The examples below are interesting variations on the standard homunculus. Use the homunculus entry in the Pathfinder RPG Bestiary and apply the variations listed for each. Apply the following changes to standard homunculus statistics. 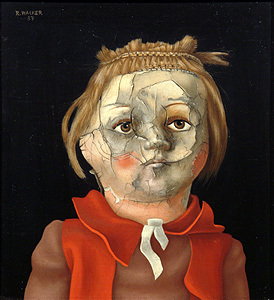 Doll—Created from rags and sticks or made entirely of wood, these come in a variety of forms. The example below is for a marionette. Substitute poison for horror gaze (Su) 1/day within 30 feet like scare spell (CL 3; DC 13). Eye—Little more than a large eye with tiny wings, vestigial legs, and a tail, this Fine homunculus can fit through even the smallest of openings to spy on the unwary. Hand—This creepy “thing” carries a certain amount of prestige among necromancers. Though not undead, it certainly looks it. Its appearance is dependent on the creature of origin. Very strong for its size, it can punch by launching itself at opponents for 1d2 +1 nonlethal damage. It can also grapple tiny foes (CMB +2). Because of its size and shape, it is very stealthy and acrobatic. Headless—How about a headless cat, rabbit, tiny dog, or chicken? Why not! Headless homunculi can use their blindsight ability to detect invisible or hidden opponents and communicate the location to their masters via telepathy. Oddly, they behave exactly like living animals—minus a head of course. Doll: hardness 2; no fly speed; attack (needle +3, 1d2−1); horror gaze; no poison. Eye: AC (+8 size); 5 hp, speed 5, fly 50; no attacks; Str 2; CMB —; CMD 5; Stealth +18; no poison. Hand: blindsight 15 ft.; AC (+4 size); 6 hp; speed 10, no fly speed; claw or punch +5 1d2+1; Str 13; CMB −4; CMD 7; Acrobatics +10, Stealth +16; grab; no poison. Headless: blindsight 30 ft; no fly speed; no attacks; Perception +6, Stealth +14; no poison. Headless cats? You are SICK. In the very best way possible. Can you imagine the party druid seeing you with your headless animal and can you sense the (entirely justified) beatdown that follows. Justified? What if you found the cat already dead? druids are into recycling right? I’m going to hell for that. Hmmm… I’m liking the idea of a Witch with a creepy porcelain doll familiar. I’d have given the Hand a constrict ability instead of jumping/punching. Strangling unfortunates in their sleep for its master. Nice idea Doomed! How would that work with such a low CMB? Or you could give it a conditional CMB bonus vs. incapacitated or sleeping foes, something like +15 to maintain a grapple (but not to start one). That way you maintain its limitation as a small grabber, but give it an iron grip that will scare the bejeebies out of any creature that sleeps!